For comment on the final vote and vote results, see here. Ahead of the October 28 UNGA election of candidates for 2017-2019 UNHRC seats, UN Watch has been leading the campaign with a coalition of NGOs to oppose the re-election of Saudi Arabia, Russia, China and Cuba, as well as the new election bids of Egypt, Iraq, Malaysia and Rwanda, by lobbying governments, and through online petitions, high profile parliamentary events, UN press conferences, university lectures, YouTube videos, and op-eds in the Washington Post and other major newspapers. Click here for the report, by UN Watch, Human Rights Foundation and the Raoul Wallenberg Centre for Human Rights, analyzing which candidates should be rejected. Click here for quotable comments on the election by leading human rights dissidents and activists. Click here for a series of YouTube videos featuring victim testimonies, and NGO press conferences, opposing the election of abusers to the UNHRC for 2017-2019. Click here for the Washington Post op-ed by Yang Jianli, Chinese dissident and UN Watch board member, opposing the re-election of China. Click here to see more of UN Watch’s latest blog posts on all aspects of the 2016 UNHRC elections. Click here for hi-res images from UN Watch events held with Human Rights Foundation and others. 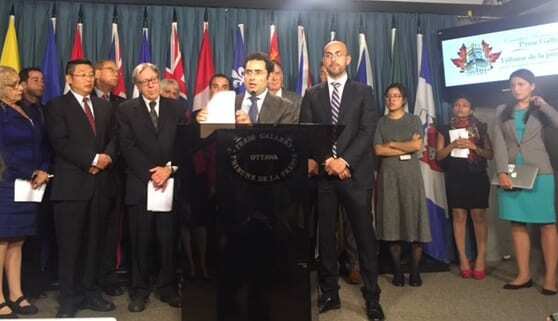 Above: UN Watch and HRF press conference in the Canadian Parliament, Oct. 5th, 2016, with victims, activists and MPs. Below: UN press conference on Oct. 6th with victims and activists.